Storm Diego will bring snow and ice accumulations, freezing rain from the southern Plains to the Appalachians, over the weekend and into early next week. The snow and ice accumulations will lead to travel disruptions and power outages across a widespread area. The storm system is causing lower-elevation rain and mountain snow in California, which will persist up to Thursday. National Weather Service has issued winter storm watches from parts of the Texas Panhandle to western and central Oklahoma. Those watches include Amarillo, Texas, Lubbock, Texas, and Oklahoma City, Oklahoma. 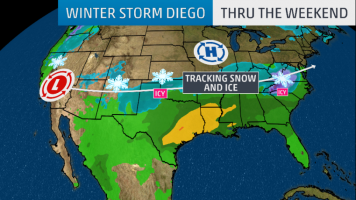 Additional winter storm watches will likely be issued farther east along the path of Diego in the next day or two. Snow is expected in southern portions of California’s Sierra Nevada and parts of the Four Corners region. Rain will soak the lower elevations of southern California and extreme northwestern Mexico. Widespread snow will develop from eastern New Mexico into the northern Texas Panhandle, northwestern Oklahoma and southern Kansas. Areas that will receive freezing rain are Texas Panhandle into central Oklahoma; farther south across Texas, Louisiana, southern Arkansas, northern Mississippi, southwestern Tennessee and northwestern Alabama. Snow, sleet and freezing rain may spread to southern Missouri and northern Arkansas by Friday night. Travel will be affected by wet and/or wintry weather on stretches of interstates 40 and 35 in the southern Plains. Snow and ice accumulations from this storm will extend from the southern Plains to the Ozarks, Ohio Valley and the southern half of the Appalachian Mountains.